Sandpiper Cove 0012 - Holiday Isle Properties, Inc.
We are offering more great deals for a week stay in April - 10% off any 7 night stay. Offer expires 04/22/2019 and you must book your vacation between 04/20/2019 and 04/27/2019. Take a look at this ideal Sandpiper Cove Villa that sleeps nine guests and is a perfect vacation destination for your family, Villa 12. Upon parking in one of the two driveways from this Villa, you will first notice the large ground floor wooden deck, complete with a gas grill, a sink, a bar, a dining table and picnic table, and additional outside seating. This shaded deck adjacent to Sandpiper Cove’s pond is a perfect place to unwind after a long day beaching while you watch the ducks gliding by. Once you enter the villa, you will come to the Washer and Dryer Room on your left, and a set of stairs leading to the main floor. The Washer and Dryer Room is large, with plenty of storage space for beach essentials, and comes with a full size washer and dryer. Once you traverse the stairs you will enter the Kitchen and Dining Area. The Kitchen has a plethora of cabinetry, a large island for meal preparation, and all the full size appliances, dishware, and silverware needed to prepare your favorite feast. The Dining Area has a one of a kind chandelier and a rectangular dining table set for eight guests. Next to the Dining Area is a set of French doors leading to one of two of the second floor balconies. This balcony is home to an outside dining table set for four guests and offers a view of Sandpiper Cove’s pond. The Living Room is adjacent to the Dining Area and Kitchen. The Living Room has a big screen HDTV, a DVD player, surround sound, three plush chairs, an ottoman, and a couch. Also on the second floor of the Villa are two of the three bedrooms. 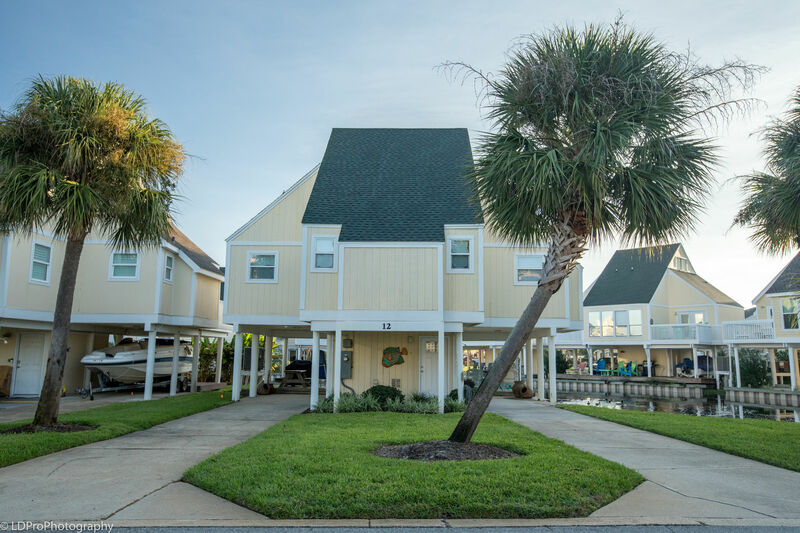 One of the bedrooms has a King bed, a flat screen HDTV, a DVD player, and private bathroom, and a set of French doors leading to a private balcony that overlooks the pond in Sandpiper Cove. This bedroom’s private bathroom comes with a Jacuzzi jet tub and shower combination. The second bedroom on the second floor is home to a Queen bed, a flat screen HDTV, and a DVD player. This bedroom is connected to a bathroom that can be accessed via the bedroom or the Kitchen. This second bathroom has a Jacuzzi jet tub and shower combination. The last remaining bedroom of the villa is accessed by going up the final set of stairs to the third floor of the property. The third bedroom has a private bathroom, a couch, a TV, two Full beds, one Twin bed. This bedroom is the perfect place for children to play and sleep. The bathroom connected to this bedroom has a walk in shower. This property is a short five minute walk to Sandpiper Cove’s private beach. Amenities include complimentary Wi-Fi internet access, a full size washer and dryer and two driveways for parking that can hold up to 4 cars. Sandpiper Cove Villa 12 is truly a home away from home. This property leaves no want to be desired and is the perfect vacation destination for your family. All this and priced to please, book this property now before it is too late!